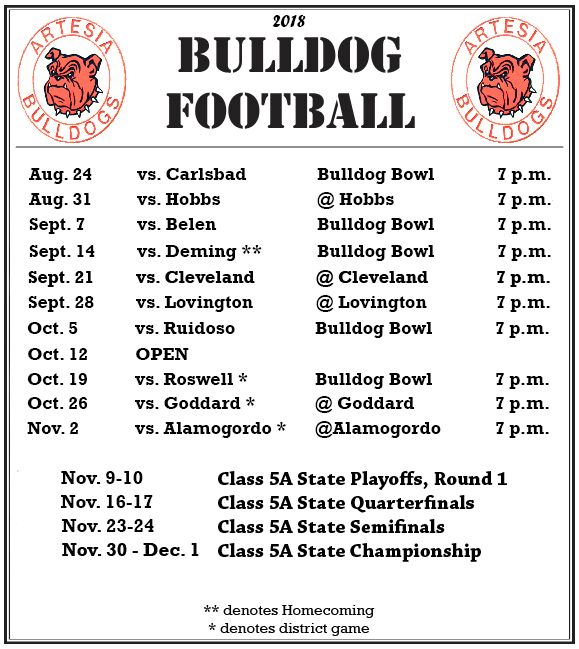 Reserved-seat season tickets for the 2018 season of Artesia High School Bulldog football are on sale now in the AHS Athletic Office at Bulldog Pit. The office is open from 8 a.m. – noon and 1-4 p.m. weekdays, and during the noon hour on home-game Fridays only. Only holders of reserved-seat tickets from last year will be able to purchase their same seats during the first two weeks of sales. Beginning at 8 a.m. Monday, Aug. 20, all remaining reserved-seat tickets will go on sale to the general public on a first-come, first-served basis. Ticket prices are $35 for lower-section reserved seats, $40 for upper-deck, chair-back seats. Season-ticket holders will also receive free admission to junior varsity games. Regular junior-varsity ticket prices are $3 for adults, $2 for students. Single reserved-seat tickets, if available, will be sold on home-game Fridays at a cost of $8 for lower-section, $9 for upper-deck. General admission ticket sales will also be conducted Monday through Friday during the week of each home game, and students may purchase tickets at their respective schools. General admission tickets are $5 for adults, $3 for students. All tickets will be $5 at the gate.